Isn't that theme so relevant and perfect for Primary this year? 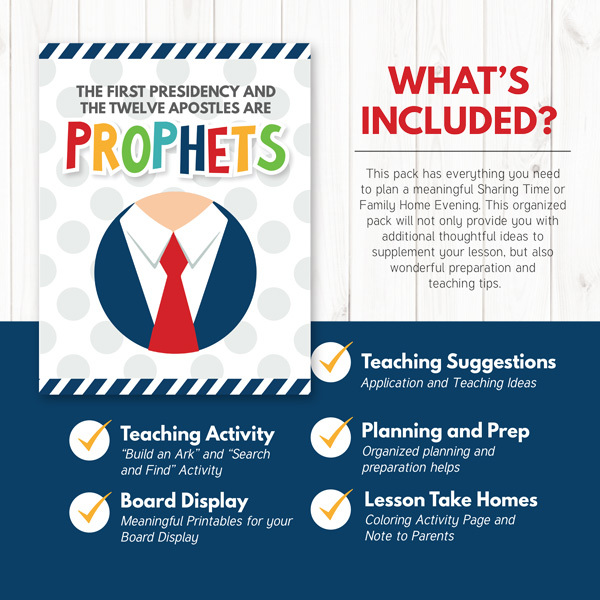 I have been working on the new 2018 Primary printables for months and really, really love the way everything turned out. It took me longer than usually because I re-designed everything like 3 times. I wanted everything to be PERFECT. It was important to me that the designs were not only "cute", but also meaningful. 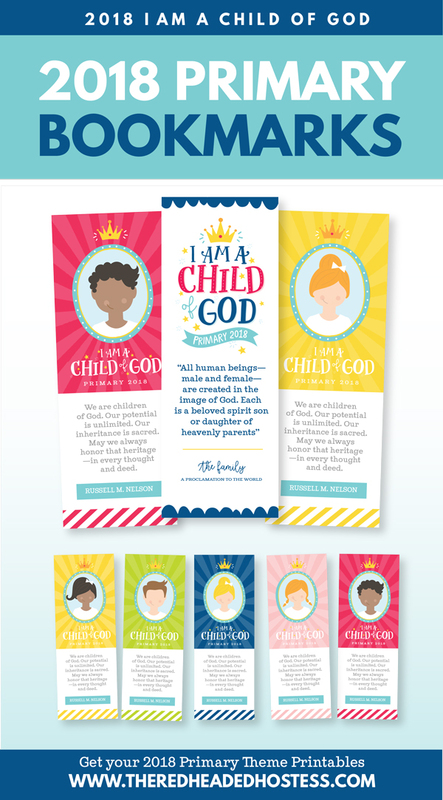 I wanted to come up with some illustrations and designs that would really help the Primary children connect to the 2018 theme, "I am a Child of God." As I thought about the 2018 Primary theme, "I am a Child of God", my mind kept coming back to three questions we would often ask as missionaries, "Where did I come from? ", "Why am I here?" and "Where am I going?'. I felt like this year we have the blessing and opportunity to help each child in Primary come to know that he or she is truly a child of God. I wanted to use illustrations that would teach the children about their divine identity, purpose, and potential. I decided to go with a crown to represent the theme. I think it is important that the children understand that they are truly precious in Heavenly Father's eyes...they are destined for royalty...they are children of God. 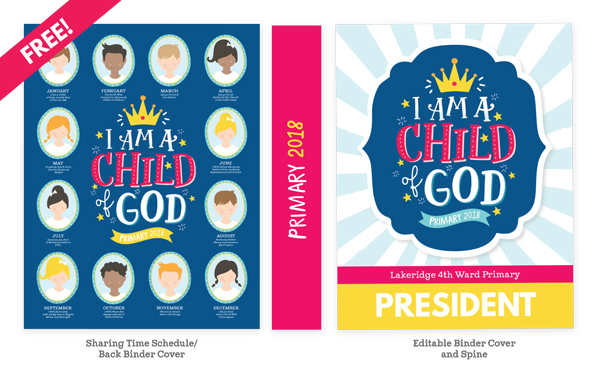 I decided to whip up some FREE printable binder covers and posters to celebrate the new 2018 primary theme. The best news is, these 2018 binder covers are EDITABLE! You can easily customize the binder covers by adding your own ward name to the files and classes! 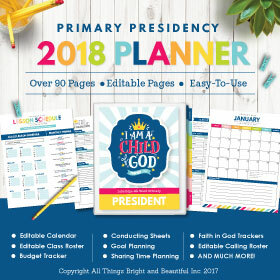 these FREE 2018 Primary theme Printables! Looking for some cute additional coordinates? We've got you covered! Take a peak below and hop over to The Red Headed Hostess for more information on some of our cute EXTRA 2018 Primary theme designs! 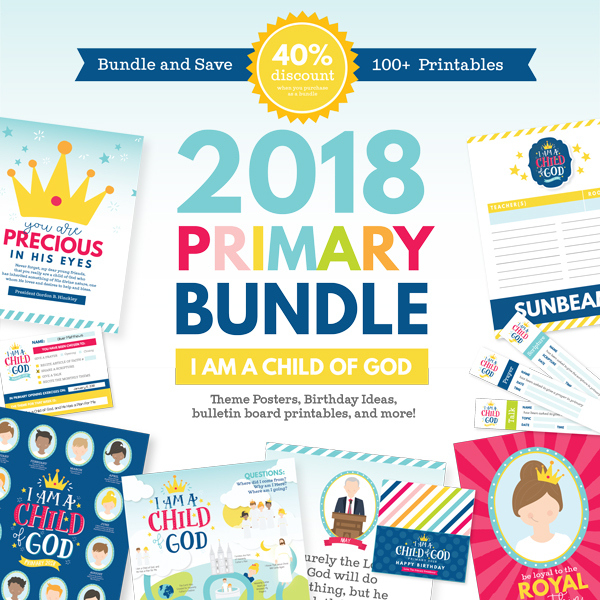 We are offering a discount price when you purchase the 2018 Primary Theme Bundle! This Primary kit is a $40.50 value on sale for $20.00! 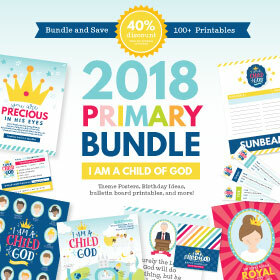 PLUS - With the purchase of our 2018 LDS Primary Theme Bundle, you will get a $5.00 coupon for one FREE Sharing Time teaching package! Don't miss out on the SUPER SAVINGS! Here is a little sneak peek into our 2018 Primary Bundle! Okay, these are some of my FAVORITES! 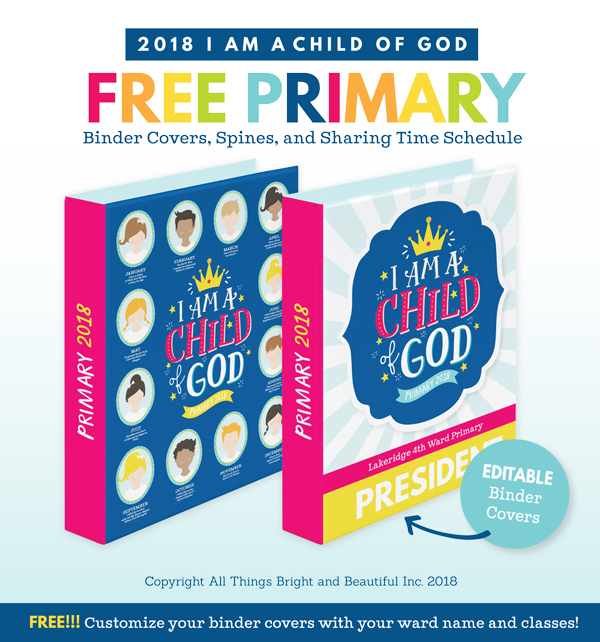 Not only will they brighten your Primary bulletin board and Primary room, but they are also a wonderful way to help the children connect to the 2018 Primary Theme, "I am a Child of God." 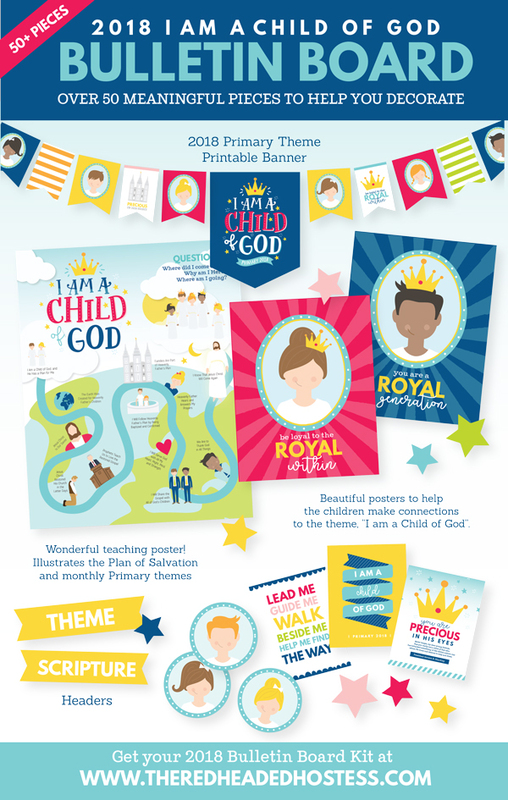 We have included a darling banner, meaningful posters, and adorable "I Am a Child of God" embellishments! These monthly Primary posters are designed to be displayed throughout the year. 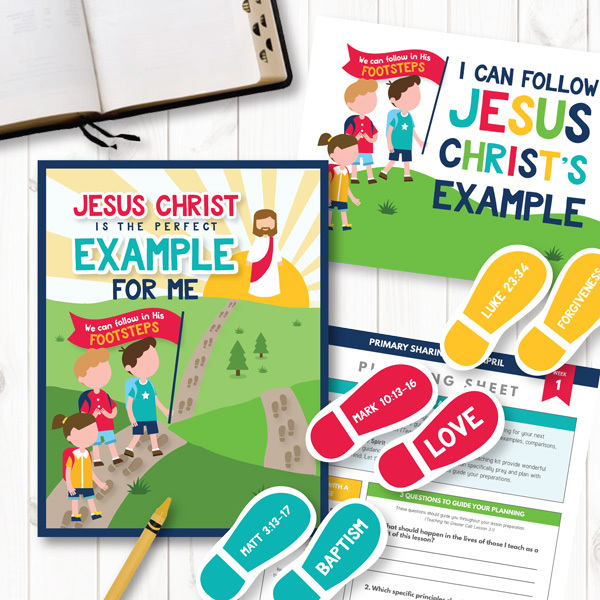 Each poster includes a meaningful illustration to help the Primary children connect to the 2018 Primary theme, "I am a Child of God." This year we created TWO coordinating posters! 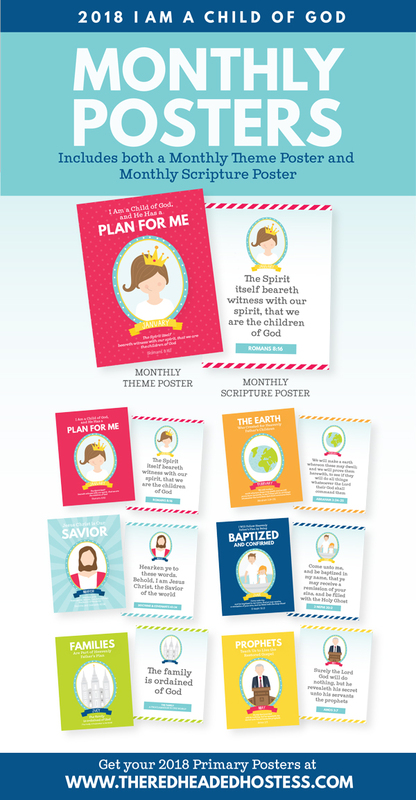 1) Monthly Theme Poster and 2) Monthly Scripture Poster. This kit comes with 6 different sized posters for your convenience! Use these great 2018 Primary Theme Sharing Time Assignment Wristbands and Sharing Time Assignment Cards to hand out to the primary children. Both items are editable for your convenience! Just print and go! 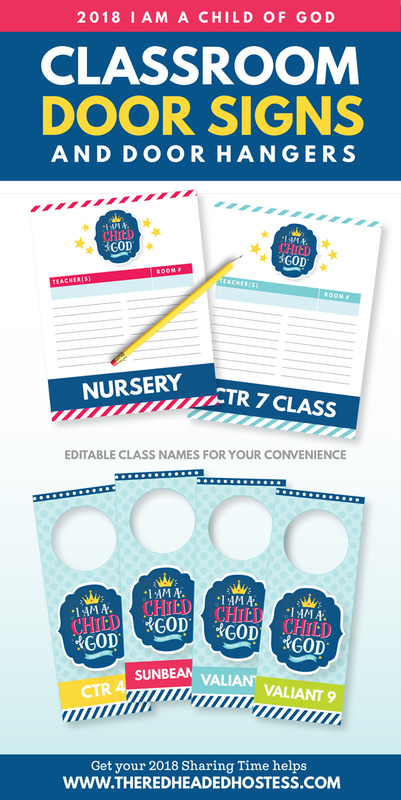 These EDITABLE classroom door signs are designed to help you stay organized and get the Primary children excited about the 2018 Primary Theme, "I am a Child of God." 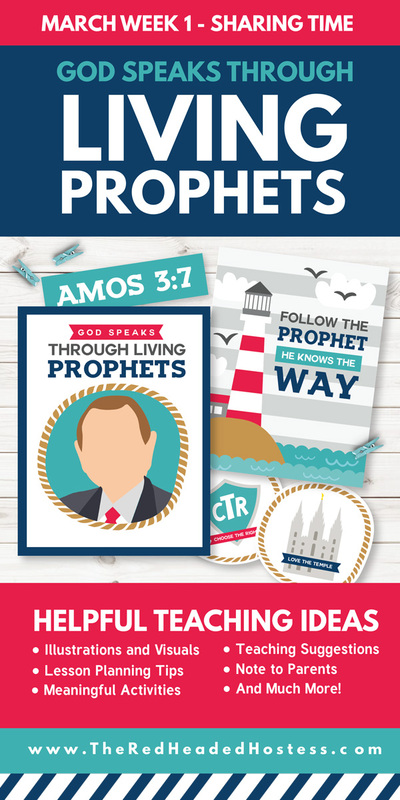 These LDS door signs are printer friendly and easy to use! This 2018 Primary Theme Birthday Kit contains easy-to-print items to help you celebrate the birthdays in Primary. We have included a variety of Primary gift ideas at a reduced price so you can pick and choose your favorites from the kit! 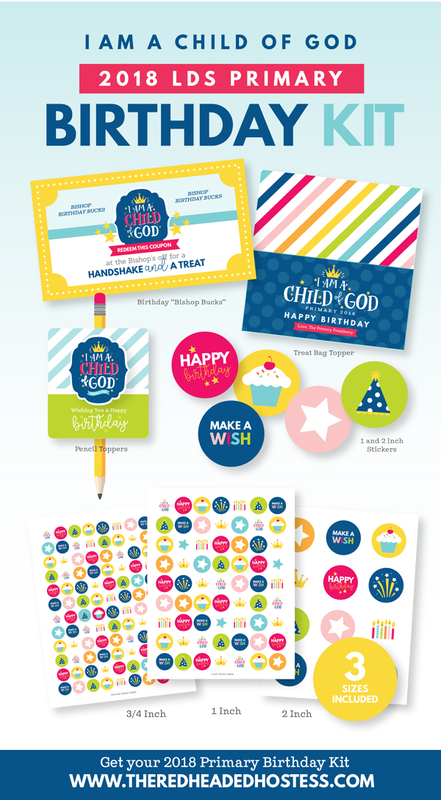 Select the Primary birthday printables from the kit that best fit your ward/branch and your needs! 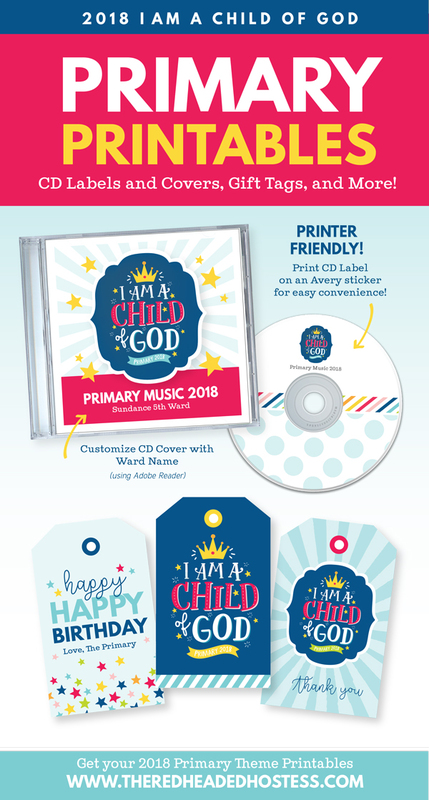 These 2018 LDS Primary Theme CD Labels and Covers are perfect for sending home with the Primary children in your ward. Encourage the Primary children to learn and practice the songs for the upcoming year! 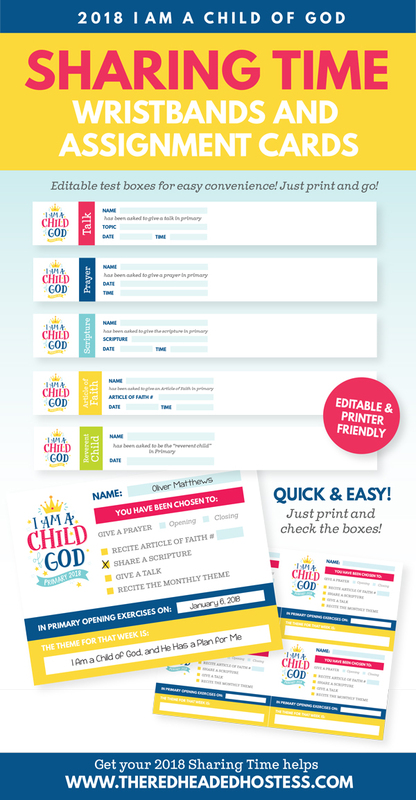 We have also included some ADORABLE "I am a Child of God" themed primary tags are perfect for any occasion! We have included TWO different 2018 Primary theme bookmark designs! 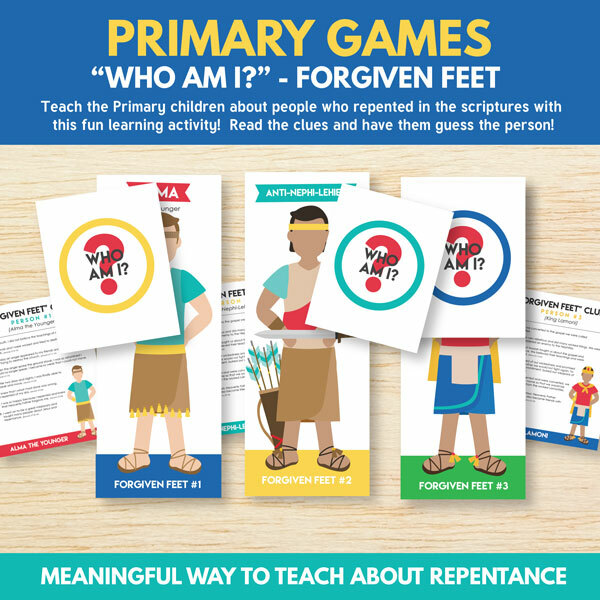 Both versions are darling and are designed to teach the Primary children about the theme, "I Am a Child of God." These are just a FEW of the items included in this amazing 2018 Primary Theme Kit! Be sure to check out more images and information at The Red Headed Hostess! It's a new month in Primary which means a new monthly theme in Sharing Time! This month the Primary children will be studying the topic, "I Choose the Right When I Am Baptized and Confirmed a Member of the Church." If you are looking for effective visuals, teaching tips, and meaningful learning activities for your next sharing time lesson, look no further! We have EVERYTHING you need here! you NEED to check this page out! Each week we are releasing more and more new ideas! Now, back to our AWESOME April Primary Sharing Time idea! What's included you might ask? 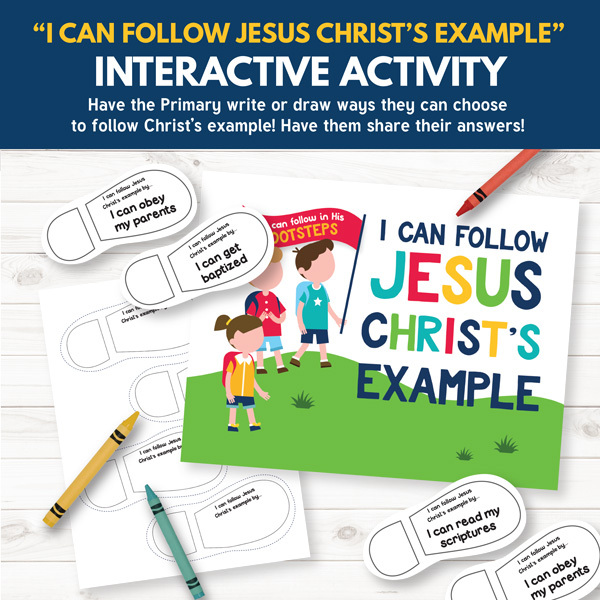 Well, each of our 2017 LDS Primary Sharing Time Kits include meaningful Primary games, learning activities, helpful teaching suggestions, and beautiful visuals and illustrations. 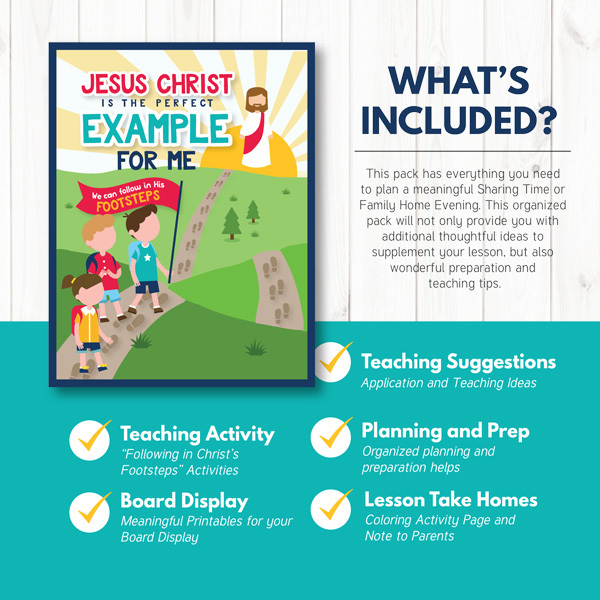 Not only is it great to Primary Sharing Time, but you can also adapt the ideas for a fun family home evening lesson! I was especially inspired by the object lesson suggested in the manual! 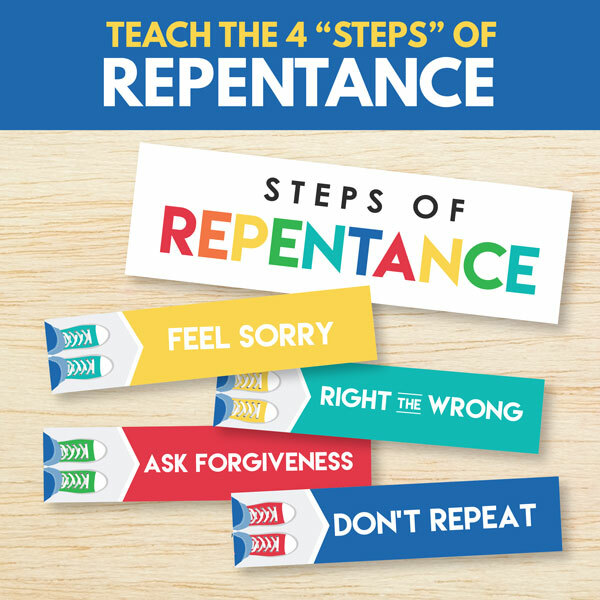 If you haven't read the lesson, check it out here! 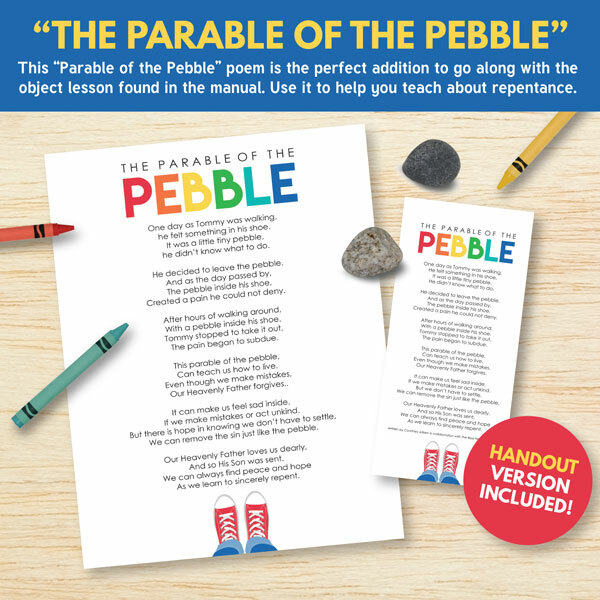 There is a terrific object lesson about a rock in a shoe to help you teach about repentance! This awesome object lesson really inspired the additional visual aides and Primary games in this lesson kit! 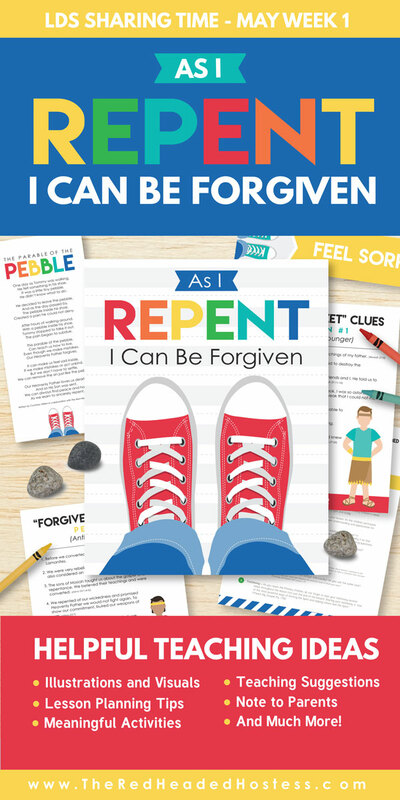 Inside this Sharing Time teaching pack is over 25 pages to help you teach how, "As I Repent, I Can Be Forgiven." We have included hands-on activities, custom visuals, and helpful planning tips! You can use all the ideas or choose your favorites! These are only a few of the ideas included in this Primary Sharing Time Pack! 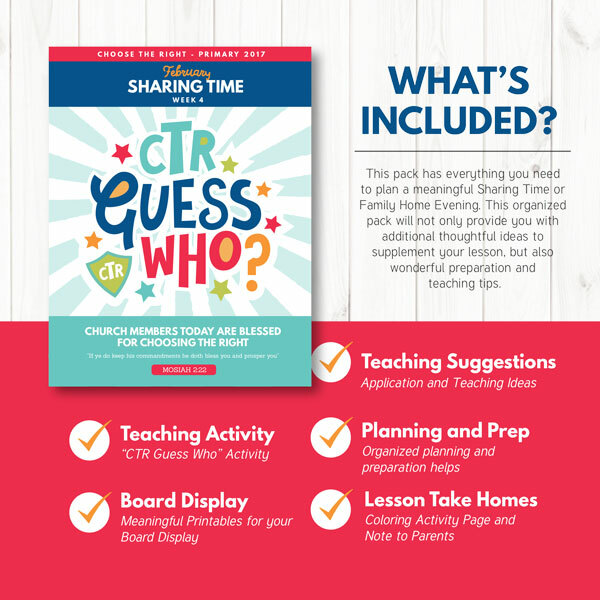 For more images and details of this 2017 LDS Primary Sharing Time kit, CLICK HERE! Wow! I am feeling so uplifted and inspired after LDS General Conference! I feel so rejuvenated and excited to center my life on Christ this month. It's also a new month in Primary which means a new monthly theme in Sharing Time! 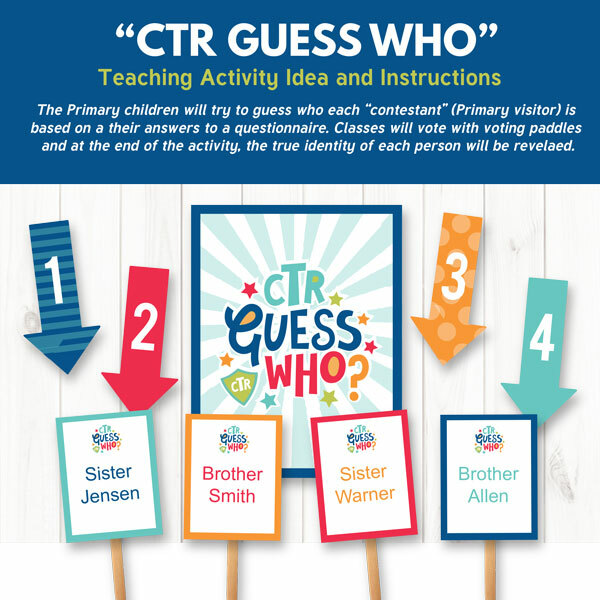 This month the Primary children will be studying the topic, "Jesus Christ Helps Me to Choose the Right". I am especially excited about this theme, as Easter approaches. What a fabulous reminder to center our lives on the Savior! 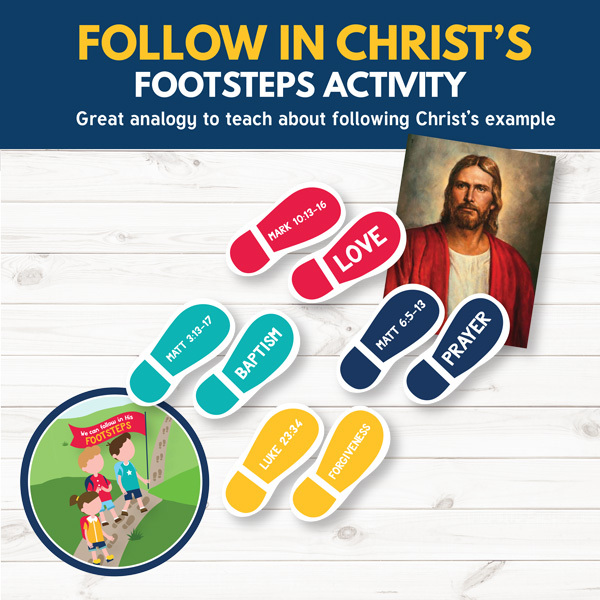 In this particular lesson for the Primary children will be learning about and engaging in fun activities that teach them how to in Jesus Christ's footsteps. 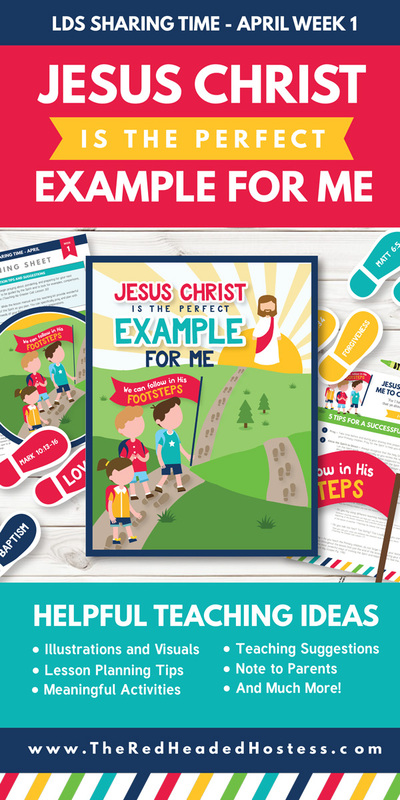 Inside this Sharing Time teaching pack is over 28 pages to help you teach how, "Jesus Christ is the Perfect Example for Me." We have included hands-on activities, custom visuals, and helpful planning tips! You can use all the ideas or choose your favorites! 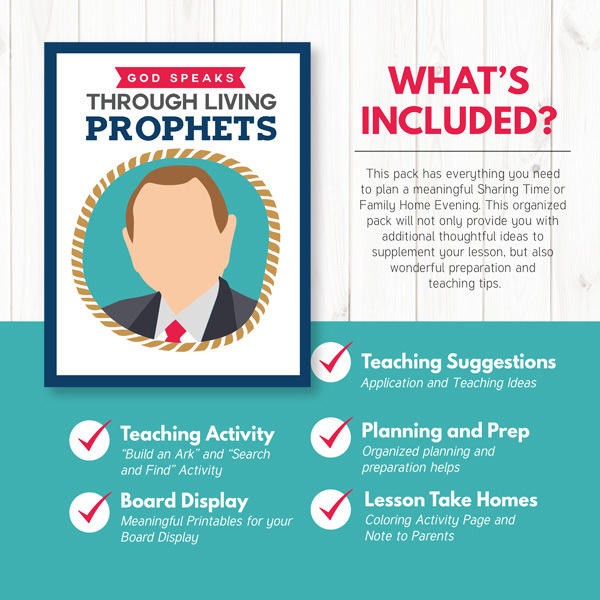 This month in Sharing Time we will be focusing on how "Living Prophets Teach Us to Choose the Right". This particular Primary Sharing Time Teaching Kit includes 30 pages of helpful suggestions. Now, back to our AWESOME March Sharing Time idea! What's included you might ask? 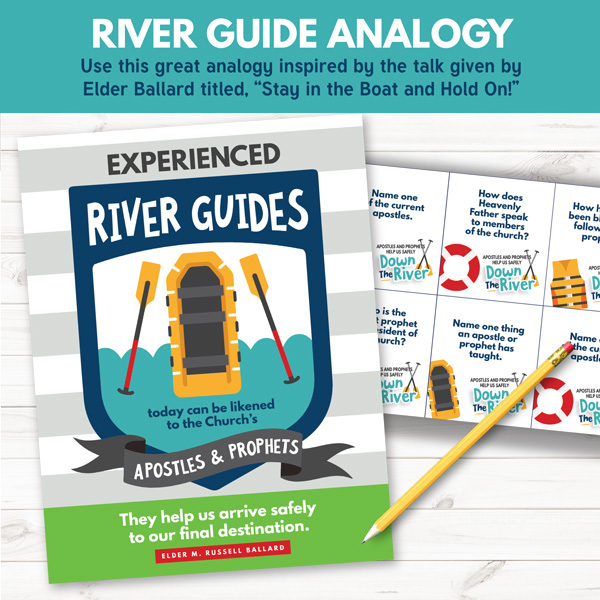 In this particular lesson for the Primary children will be learning about how "The First Presidency and The Twelve Apostles are prophets" with a fun river guide analogy inspired by Elder Ballard's talk, "Stay in the Boat and Hold On!" 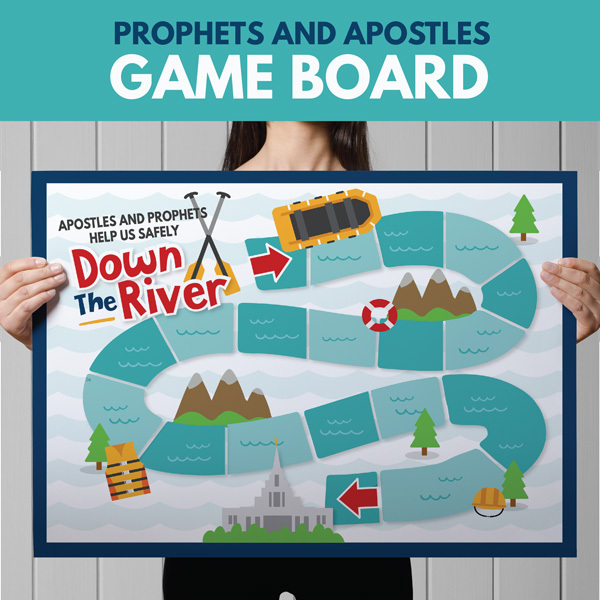 We have also created this awesome "Apostles and Prophets Help Us Safely Down the River" game to teach the Primary children! 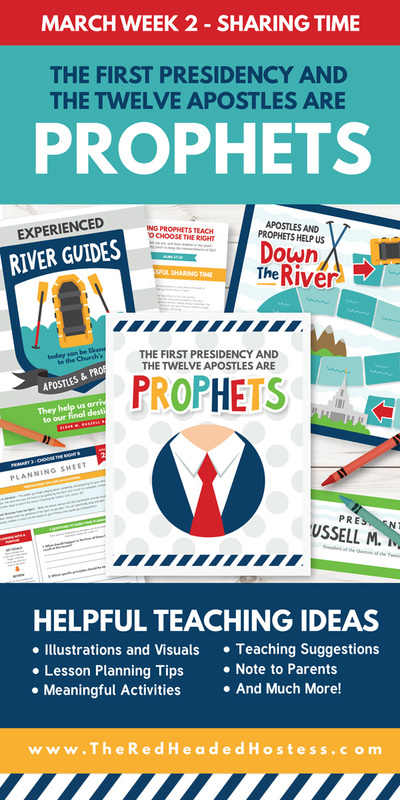 Inside this Sharing Time teaching pack is over 30 pages to help you teach how, "The First Presidency and the Twelve Apostles are Prophets." We have included hands-on activities, custom visuals, and helpful planning tips! You can use all the ideas or choose your favorites! you have to check out THIS PAGE. Each week we are releasing MORE and MORE ideas! 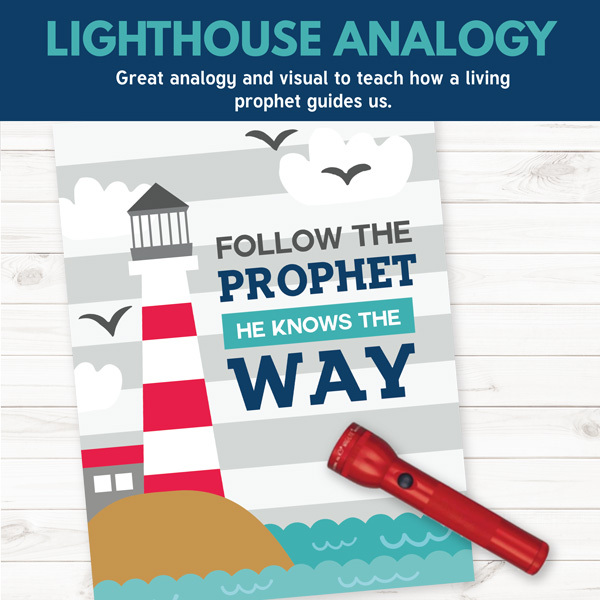 In this particular lesson for the Primary children will be learning about how "God Speaks Through Living Prophets" with a fun lighthouse analogy! 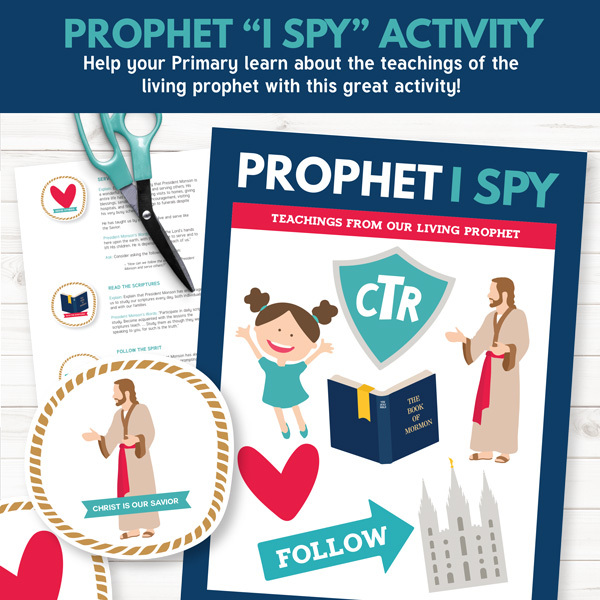 We have also created this awesome "I Spy" game to teach the Primary children about some of the teachings from President Monson! Inside this Sharing Time kit is also ideas that compliment the manual suggestions! 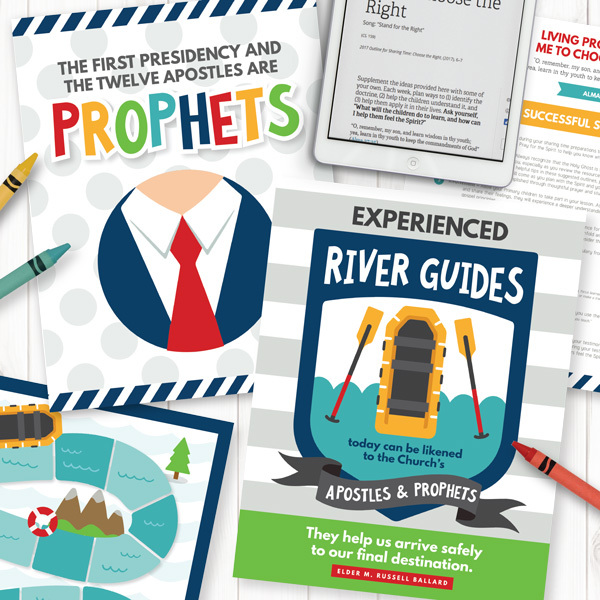 For instance, we included some great visuals to help the Primary children memorize the scripture Amos 3:7. 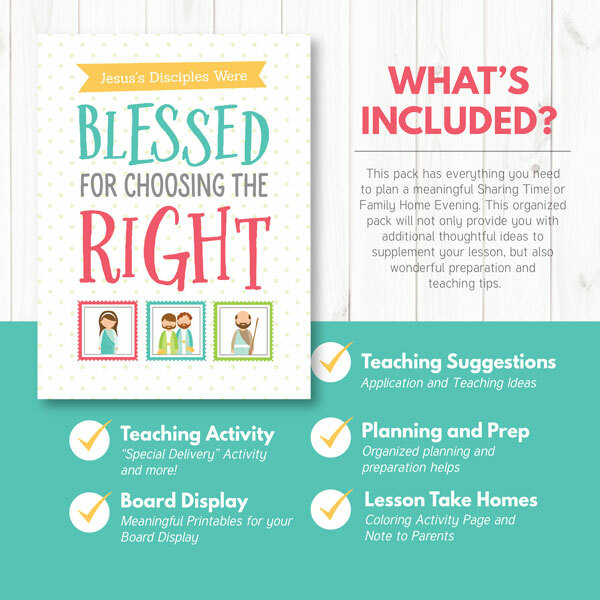 This month in Sharing Time we have be focusing on how are blessed when we choose the right. Now, back to our AWESOME February Sharing Time idea! What's included you might ask? 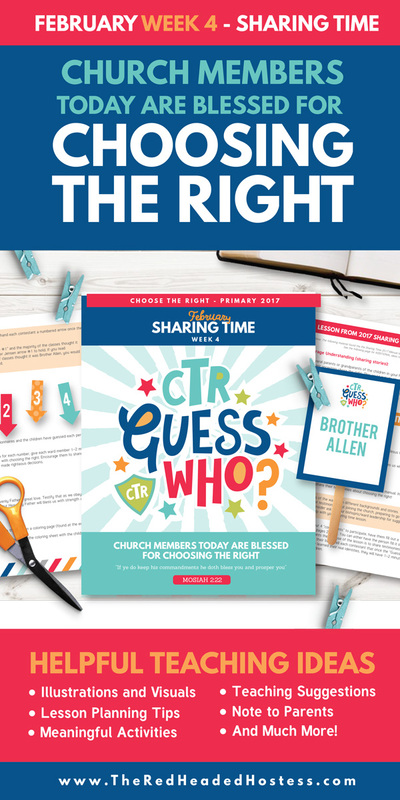 In this particular lesson for the Primary children will be learning about how church members are blessed for choosing the right with a fun "CTR Guess Who" activity. 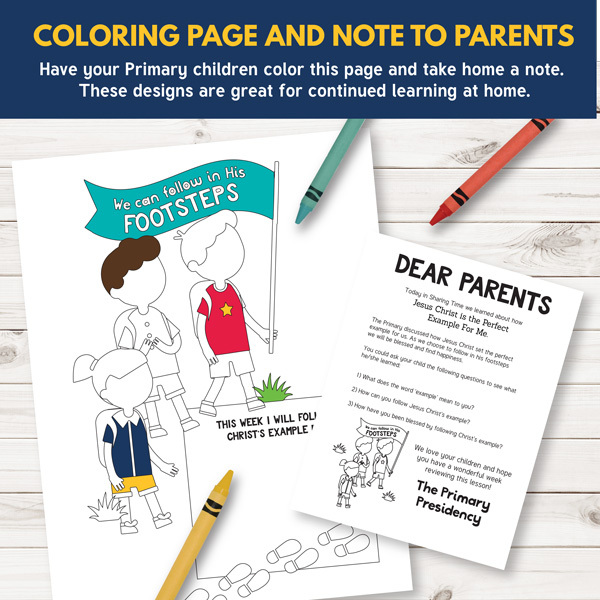 We have created this great coloring page to help your Primary children make meaningful connections! Help them understand how they will also be blessed for choosing the right! 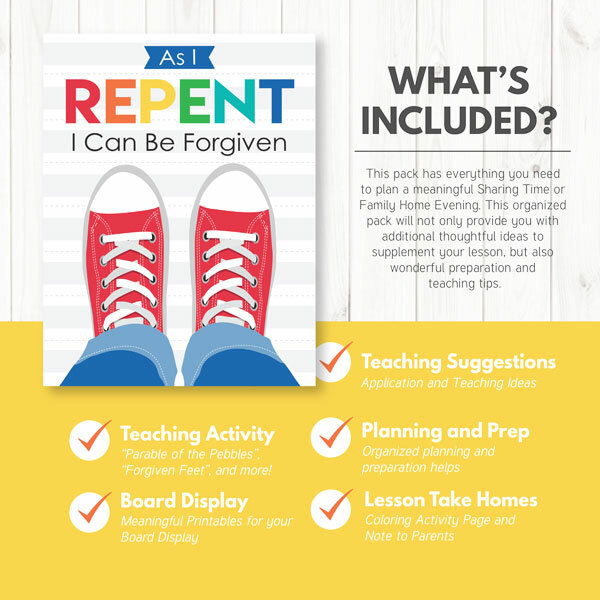 This fun activity isn't the only thing we have included in this pack! It is jam packed with teaching helps, visuals, take-home helps, etc! For more images and details of this 2017 LDS Primary Sharing Time kit, CLICK HERE! It has been such a joy creating LDS Primary Sharing Time helps for this year's curriculum. I am especially excited about this week's sharing time lesson! we will be focusing on how are blessed when we choose the right. 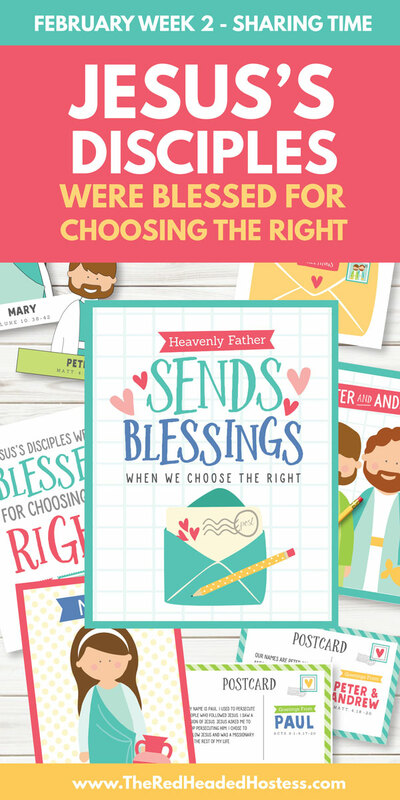 "Jesus's Disciples were Blessed for Choosing the Right." includes over 20 pages of helpful suggestions. 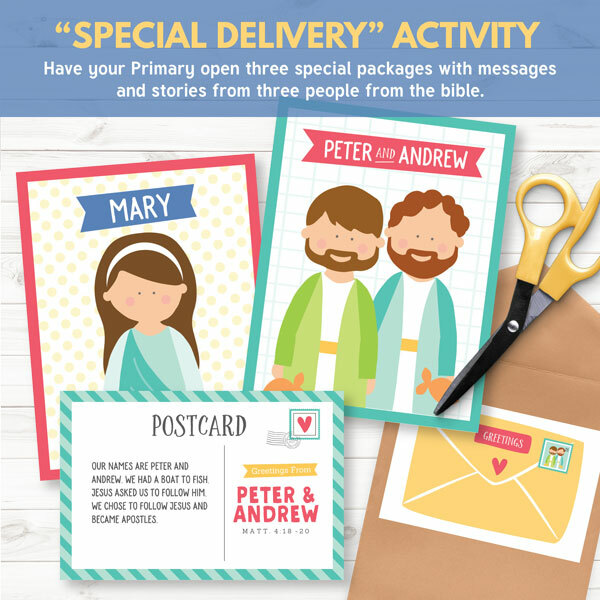 Well, each of our 2017 LDS Primary Sharing Time Kits include meaningful Primary games, effective visuals, learning activities, and helpful teaching ideas and suggestions! In this particular Primary sharing time lesson the children will receive three special delivery packages! Inside each package is a person from the Bible and their story about how they were blessed for choosing the right! 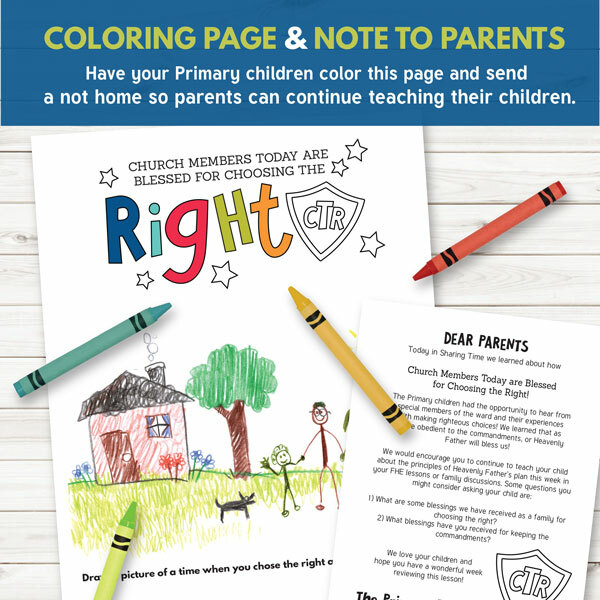 We have created this great coloring activity to help your Primary children make meaningful connections! 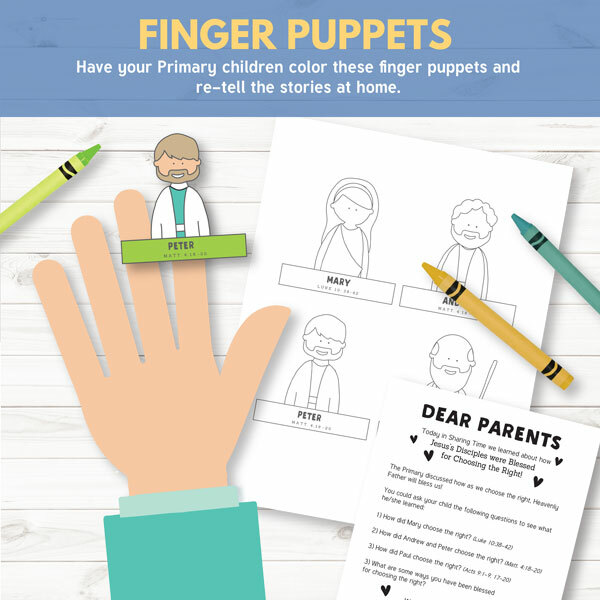 Have them create these fun finger puppets to retell their families what they learned in Primary!